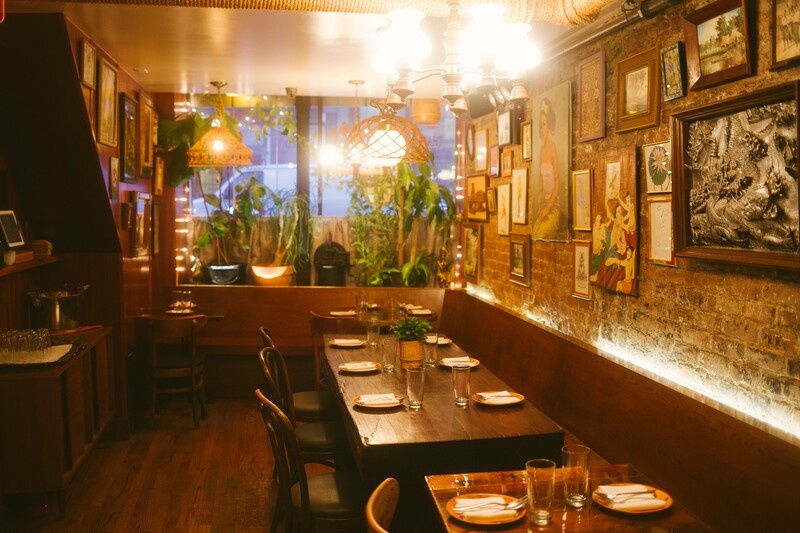 Uncle Boons has not traditionally been one of “our spots.” We love this Nolita Thai restaurant and gave it a very high rating not long after it opened. But for some reason, it hasn’t been a place we’ve spent the last few years recommending frequently to friends. But a few internal conversations and a strong desire for really good Thai food recently brought us back to Uncle Boons and forced us to come face to face with the question: Why don’t we talk about this place more? Despite not having a good answer, it’s time to rectify the situation. Uncle Boons is one of the great dining experiences of NYC. It’s not just a place where you can eat unbelievable curry, and a ridiculous sundae, and the coldest beer known to man. It’s a place where you can eat all of that in an underground treehouse that might have been decorated by a Thai grandma who’s addicted to Craigslist. And it’s a place that’s as suited for a fun date night as it is for a dinner with friends celebrating nothing other than your eating talents. The buzz around Uncle Boons may have died down – but the buzz at Uncle Boons is still going very strong. It’s always packed, and that buzz is contagious. There are always new restaurants opening in New York. Some are successful, some not so much. But Uncle Boons is proof that the good stuff finds a way. Even if it does so quietly. Uncle Boons is now officially one of our spots. And it should be one of yours, too. We’ll make this an easy decision: Do you like raw scallops? If yes, order these. Never tried them? These are a great way to start. A shredded mango salad with shallots and peanuts in a spicy, limey, avocado-y dressing. You’re going to want this, if for no other reason than to feel slightly less bad about everything else that’s worse for you on the table. Uncle Boons has a whole menu devoted to charcoal grilled “goodies,” and the baby octopus option is one you need to get your mouth around. These goodies are super charred and crispy at the edges, with a tart lime sauce for dunking. If you’re going to order one item from the small plates section, make it this: a pile of spicy chicken, crispy shallots, banana blossom, and cashews, in a somehow both rich and refreshing chili dressing. Thus begins our lifelong campaign to make all salads include spicy meats. Another meat salad from the small plates section, with minced lamb, cucumbers, mint, pickled onions, and chiles. It’s a very good dish, but we’d still order the spicy chicken salad over it. There are two main reasons Uncle Boons now haunts our dreams, and this is one of them: a thick, super rich broth, plus a chicken leg, homemade noodles, and some greens. We’d like to swim in this bowl. We’ve peaked. We’re never going to eat a better short rib dish in our life. Which is only sad until we remember that we can eat them here whenever we want. These come in another insanely good curry - add an order of roti so you can make yourself Thai short rib tacos. A highly addictive fried rice packed with crab meat. Skipping this would be a mistake. We get it. You over-ordered and you think you can’t eat another bite of anything. But you’re going to order this anyway, and you’re going to be so glad that you did. This belongs in the NYC dessert hall of fame. And if that doesn’t exist, we’re starting it now. Crispy, buttery, sweet dessert french toast. This is also excellent, but if you’re going to pick just one dessert, make it the sundae. Otherwise, you need both. Uncle Boons is one of our favorite Thai restaurants in NYC, and this is their little takeout operation in Nolita.